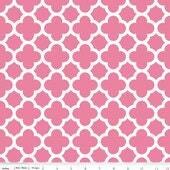 Quatrefoil is a classic design with four concentric, overlapping circles. It’s been used in art and architecture, and religious symbols for centuries. Up to two yards will be shipped Standard USPS.